Next week Bollywood's most talked about couple Abhishek Bachchan and Aishwarya Rai Bachchan will celebrate their first wedding anniversary, April 20. 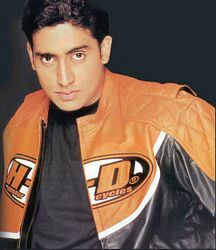 Currently Abhishek is in Miami, USA to shot for movie Dostana (2008) and hence the couple will celebrate their anniversary in Miami. There anniversary will also mark the unveiling of their upcoming movie Sarkar 2 (2008) .